The new Vehicle Spy has support for our neoVI FIRE 2, our next generation data logger and vehicle interface, CAN FD, TCP/IP View, DBC Compare Utility, and more. Read on below to find out more. Support for neoVI FIRE 2, Intrepid's next generation vehicle network tool that is compliant with GM's Global B networks. Monitor and transmit on all neoVI FIRE 2 networks simultaneously. neoVI FIRE 2 provides Ethernet (DoIP / XCP), eight channels of CAN FD and four channels of LIN in one tool. All channels run simultaneously and are time stamped in hardware. Create and edit CAN FD frames up to 64 bytes with a baud-rate switch. Support for CAN FD ARXML. Easily view all open TCP/IP connections with other nodes. Track and monitor the status of each connection. Support for GM Cybersecurity functionality. Record an FSA conversation between 2 or more ECUs. Simulate one of the original ECUs by replaying the exact same conversation back to other ECUs. Efficiently reproduce communication problems over and over. Quickly see the differences between DBC files. Clearly see how many DIDs or Direct Memory reads can be selected for a given ECU based on the ECU's capacity. Easily set up Vehicle Spy or a data logger to record XCP, CCP, GMLAN or ISO 14229. 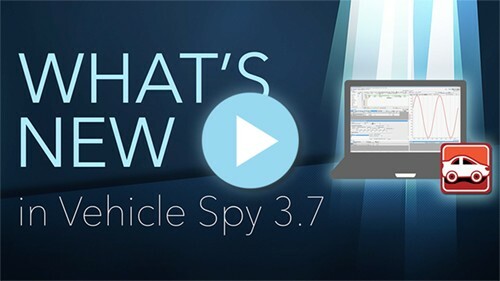 To experience the latest version of Vehicle Spy for yourself, download the trial version. To find out more about Vehicle Spy's new features, call us at 031 698 3460. We're even happy to give you a free demonstration! If you're an existing customer with an eligible license and would like to upgrade to Vehicle Spy version 700, email us your hardware serial number and we'll send you Vehicle Spy 700. Note for Wireless neoVI Users: Please do not update your Vehicle Spy version without first contacting your sales representative. Depending on your Wireless neoVI server, you might encounter compatibility issues.